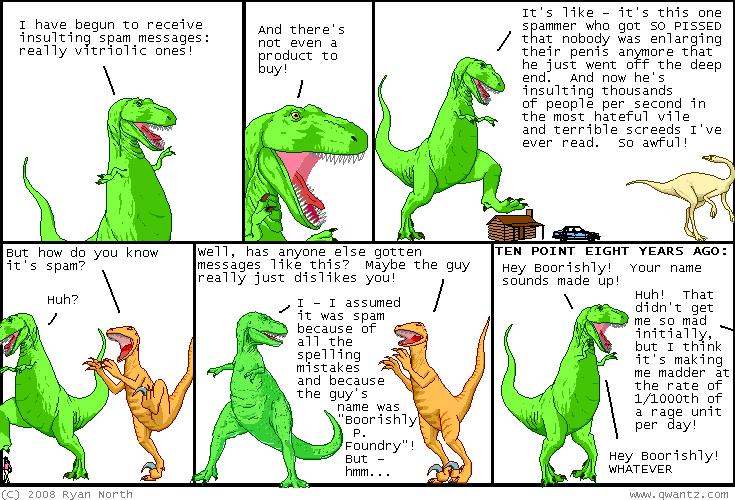 Dinosaur Comics - August 14th, 2008 - awesome fun times! August 14th, 2008: I was on the CBC yesterday: I did an interview with Sounds Like Canada and we talked about my comics! They've put the conversation online and you can listen to it right here. It was fun to do because the host was in Vancouver and I was in Toronto, and with the headphones they gave me, it was like the voice of God was coming from above and asking me questions. Good times! I got the chance to give shouts out to some very excellent webcomics, including Achewood, Kate Beaton's Comics, and A Softer World. RECOMMENDED READING YOU GUYS. One year ago today: Aw geez, Utahraptor, can't you see he needs some time to get the characterization down? Antonio Tony II is all over the place.